Depending on your product and method of conveyance there are many ways to merge, divert, and combine multiple lanes of product into one lane. We have many years of experience in merging, diverting, and combining some of the most difficult products. The basic premise of merging is to create lanes of slugged back to back product of a predefined length then merge each lane of slugged product into a single lane. The lanes are controlled using a product stop and a photo eye to establish the proper “slug” length of products which have been accumulated back-to-back. Once the pre-determined “slug” length requirement is met, this slug can be released and merged into a single lane. Merges can be integrated with Dillin’s full line of products and controls to provide a stand-alone piece of equipment or a complete, customized system. 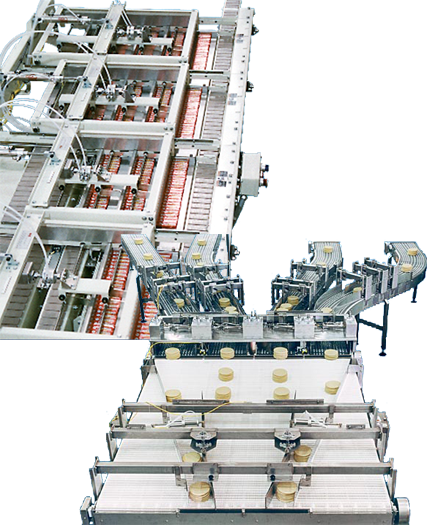 Light to medium products such as trays, cartons, bottles, etc.